Firebrand Innovations developed technology and sold intellectual property. The company began as a way to monetize videoconferencing IP owned by the founder. We completed development of a fully deployable prototype of our first product, VideoConversation™. While we are no longer actively pursuing buyers for this IP product we are very happy with our results! While Firebrand Innovations is not currently operating, we may choose to perform further development in interesting intellectual property in both video conferencing and other industries. Robert graduated with a B.S. in Computer Engineering from Rensselaer Polytechnic Institute. 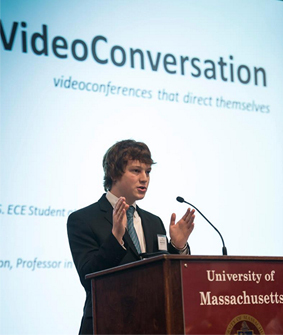 His strong background in both hardware and software design helped in his development of our VideoConversation prototype. Rex is a patent attorney at Fish and Richardson who has been with the team since 2007 when we filed our first patent. Ed is a patent attorney at Wolf Greenfield who joined our team as an adviser during the UMass Innovation challenge. Andrew is a product engineer at Cisco Systems who gives the team industry perspective and also joined the team during the UMass Innovation challenge.